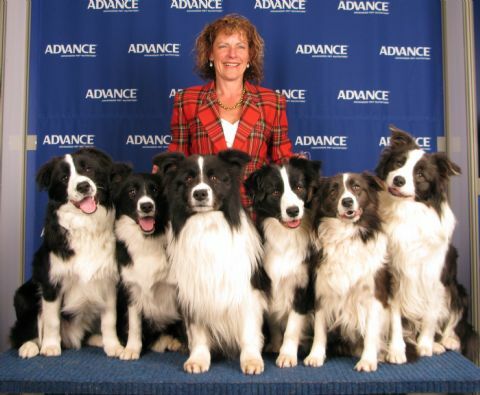 Welcome to Steadfast Border Collies. We are a small, select kennel located in Geelong Victoria. We now have 19 Australian Champions, 11 Endurance Titled and 2 Obedience Titled dogs to our credit and pride ourselves on breeding quality pups that are not only pleasing to look at but will make that excellent family companion. We take advantage of the current hereditary disease testing to ensure healthy, happy representatives of this special breed. All dogs in my kennel are DNA profiled and I am pleased to report they are all CLEAR of CL, TNS and CEA. My breeding stock has also been Gonioscopy tested. My family consists of myself, (Gaye) and 3 children: Todd, Ryan and Darci. My children play an active role in socialising my dogs as well as (very occasionally) assisting with feeding puppies and adults. Darci plays an integral part in the birth of my litters and rearing of them. If pups need to be supplemented, she enjoys this immenseley. She often selects the smallest in the litter to give her extra love and attention to! All dogs are raised in a loving, family environment where they are pets firstly and show animals secondly. As well as a fluctuating number of dogs, we also have cats and birds. Feel free to contact me for Stud and Puppy enquiries. All "Steadfast" stud males are Show Champions, have been hip scored, are clear of all hereditary diseases and have excellent temperments. I have black and white and blue and white stud males available.